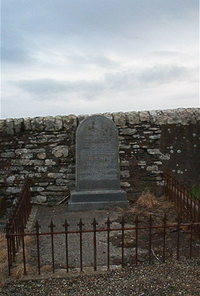 Erected by William Ronaldson flesher of Lybster in memory of his son. Alexander Watt Ronaldson born 1st January 1866 died 22nd September 1881. Was my fathers son tender and only. Beloved in the sight my mother. Sister Alexanderina Ronaldson died 30th June 1904 aged 40. Father William Ronaldson died 11th March 1911 aged 78. Mother Jane Watt died at Rosebery House Thurso 18th July 1919 aged 90 interred here. Thanks be to God which givith us the victory through our Lord Jesus Christ. 1st Corinthians XV. verse 57.